The Neuroradiology Section offers a full service of diagnostic imaging techniques of the brain, the spine, and of the head and neck regions utilizing computed tomography (CT), and magnetic resonance (MR) imaging. Myelography and lumbar puncture procedures are also performed with flouroscopy. State-of-the-art imaging techniques have been implemented with CT and MR imaging that include perfusion, diffusion, and spectroscopy. Non-invasive MR angiography, MR venography, CT angiography and CT venography imaging exams are routine. Vessel wall imaging is also performed to evaluate complex cerebral vasculature cases to evaluate for vasculitis. Head and neck specialized imaging includes orbit, ear, sinus, face, skull base, cranial nerve, soft tissue neck, thyroid, and parathyroid examinations. NM neuroradiology is part of a multi-disciplinary comprehensive stroke team. We are performing acute stroke work 24/7. Our protocols have been built based on the 2018 American Heart Association guidelines. We utilize whole brain perfusion CT imaging to help guide treatment decisions. The perfusion analysis is performed with the cutting edge iSchemaView RAPID software that was validated in recent large stroke trials. Arterial analysis for occlusions, stenosis or aneurysms are emergently performed with CT angiography. MRI and MR angiography is utilized for subacute and follow-up analysis and when higher contrast detail is necessary to determine what is the diagnosis. Advancements in MRI make it possible to evaluate the location of brain tumors based upon neuroanatomical and neurofunctional information far beyond what is available by conventional MRI examinations. 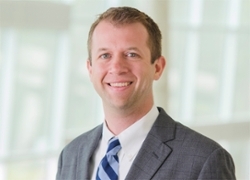 UNMC neuroradiology, which practices at Nebraska Medicine, has established a program to perform advanced brain tumor mapping in order to map gray matter function, the intricacies of white matter pathways and how these relate to brain tumors or other masses. Functional cortex is determined utilizing functional MRI. The complex white matter tracts are mapped out utilizing diffusion tensor imaging (DTI) techniques. We work closely with neurosurgery, neurology, and neuropsychology to determine the significance and utility of our findings. There are numerous reasons that functional mapping should be performed if you have a brain tumor. Brain tumors often distort the brain and this can make it impossible to determine exactly where functional brain tissue lies on anatomical images. Functional brain tissue can reorganize (change position) in the presence of a brain tumor. Advanced neuroanatomical and neurofunctional information can be vital in order to optimize decisions about treatment options. This information helps clinicians decide if surgery is possible, if a total resection can be attempted, and how to approach the resection. Utilizing advance neuroanatomical and neurofunctional information intra-operatively can help realize a surgical resection with the greatest preservation of function possible. UNMC neuroradiology helps make this possible. At Nebraska Medicine we not only generate advanced neuroanatomical and neurofunctional information but export this data into the operating room for use by the neurosurgeons during surgery. The functional brain maps are merged onto high resolution anatomical images of the brain so that the functional tissues relationships to the underlying brain tumor can be easily demonstrated. Our team has extensive experience utilizing these techniques. We are constantly comparing our data to intra-operative findings and post-operative functional outcomes. Advanced mapping doesn’t guarantee functional preservation but it helps to optimize it. In many circumstances advanced brain functional mapping is often the only way one may gain a better estimation on what functional outcomes should be expected to be preserved and a clearer understanding of what functional losses may occur with surgery. We perform functional magnetic resonance imaging (fMRI) utilizing numerous paradigms. We evaluate language, auditory, vision, skin sensory and motor functions. In order to obtain a comprehensive understanding of language we will perform paradigms utilizing verb generation, word generation and/or sentence completion. Each gives a slightly different evaluation of language function. Passive listening is utilized to test auditory activation. Motor functional analysis may involve finger tapping, foot tapping, and lip motion. We recently have instituted a resting state MRI paradigm. This is a promising technique that should allow us to obtain functional brain information even when a patient is not able to successfully complete a routine paradigm. A computer driven fMRI paradigm system delivers the data to the patient. In real-time we analyze the data as it is generated. This allows us to tell if a certain activation paradigm is working or not. If something is not working we then are able to intervene and try a new approach in order to maximize the possibility of getting the functional activation we are seeking. Functional magnetic resonance imaging activates brain cortex. To optimize evaluation the activation maps are overlayed /analyzed in comparison to high resolution conventional MRI images such as T1-weighted gadolinium enhanced images or T2-weighted 3D FLAIR images. The fMRI data is also mapped in comparison to critical white matter pathways. Fig 1. 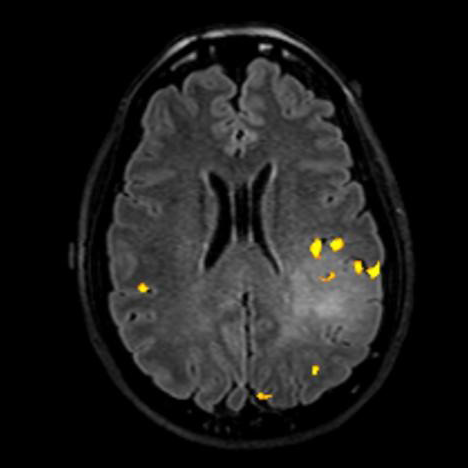 This is a T2–FLAIR image with language activation (yellow areas) seen adjacent to the hyperintense lesion on the left. This means the language functional cortex would be at risk with resection of this mass since language activation is right at the edge of the mass and activation is also present within the center of the lesion. Fig 2. T1 FLAIR image with a mass demonstrated in the left posterior frontal lobe. 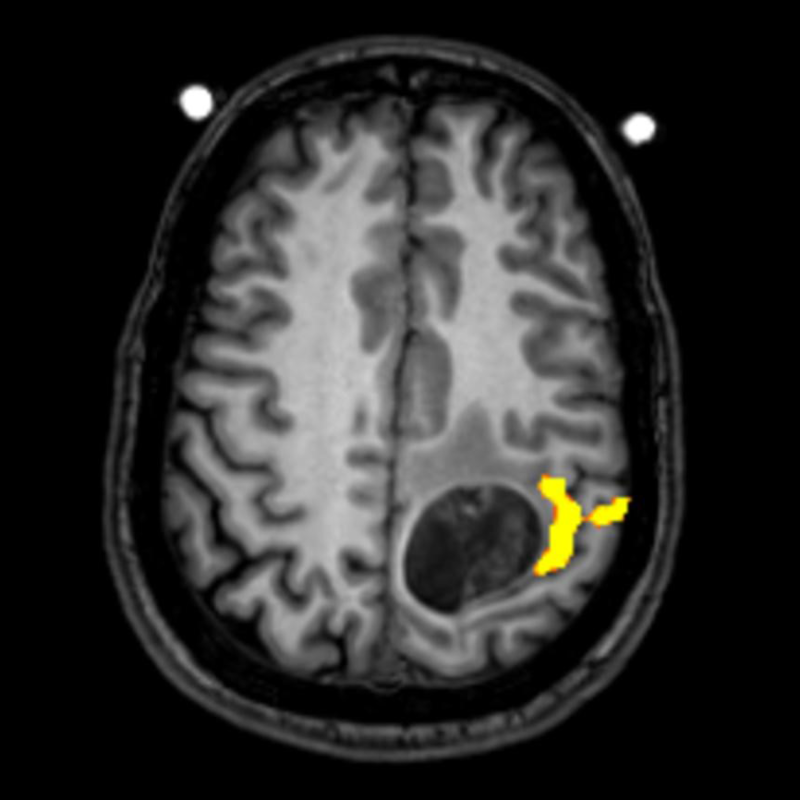 The fMRI activation (yellow) is seen at the edge of the lesion. The area of activation was created with right finger tapping. This indicates the mass is in the motor strip and alerts the neurosurgeon to the risk of creating motor deficits at surgery. DTI is based on the differential motion of water parallel to neural pathways in the brain versus perpendicular to neural pathways. 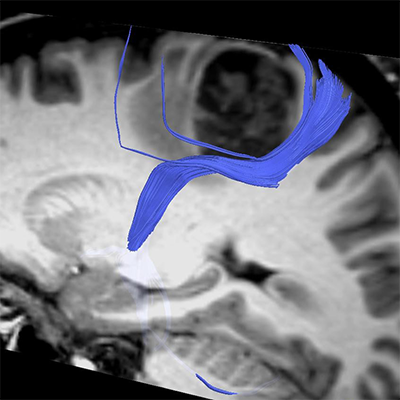 Utilizing advanced computer analysis and an understanding of the neuroanatomy the white matter tracts can be mapped out. DTI white matter analysis can help demonstrate white matter tracts that are deviated or displaced by a tumor versus invaded or destroyed. Visualization of the deviation/displacement of the white matter neural pathways by a tumor can be determined in 3D space of the brain and how this relates to the brain tumor. 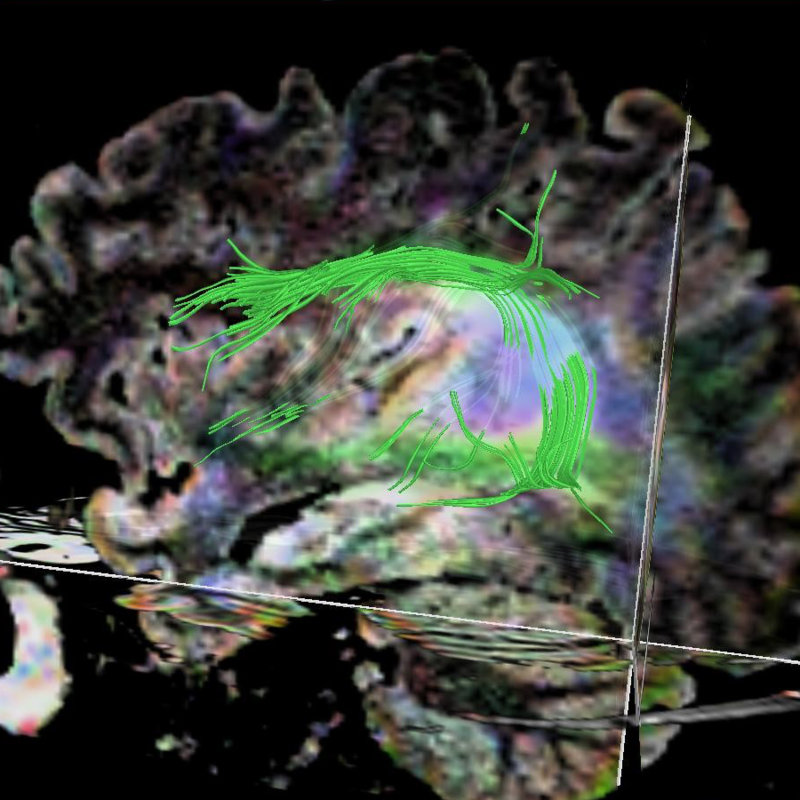 The DTI white matter analysis is performed by using multiple methodologies. The white matter neural pathway tracts may be created utilizing anatomical data derived from DTI metrics (color FA maps) and high resolution morphological images. fMRI data is also overlaid on the DTI data sets and used to analyze the white matter tracts arising from the areas of neuro activation. Fig 3. This is a sagittal T2-FLAIR image of the same patient seen in figure 1. The arcuate fasciculus (green fibers) is seen to wrap around the T2-FLAIR hyperintense mass. The arcuate fasciculus connects regions of the brain involved in language. This again indicates that in this patient resection of the mass would likely cause language deficits secondary to the mass extensively abutting the arcuate fasciculus. The etiology of a brain lesion can be difficult to be certain of by routine MRI. Advanced MRI techniques offer ample opportunities to improve the possibilities of determining the etiology of a brain lesion non-invasively. 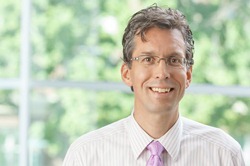 UNMC neuroradiology is dedicated to providing patients access to multiple techniques in order to provide as accurate of a “virtual brain lesion biopsy” as possible. The neuroradiology section has a long history of utilizing multiple advanced imaging techniques to determine what the underlying cause of brain lesions are. Magnetic resonance spectroscopy, brain perfusion analysis, and diffusion weighted imaging analysis are available to analyze brain lesions. These techniques often help us determine the likelihood of a brain lesion being a tumor, due to inflammation, a demyelinating plaque or an ischemic stroke. If the lesion is a tumor our analysis can also help determine how high a grade (aggressive) a brain tumor might be. Most of these techniques are optimally performed at 3T but if a 3T exam cannot be performed we are able to perform the examinations at 1.5T. These techniques are also useful for evaluating if there is tumor recurrence or if findings on conventional MRI are due to treatment change. Integrating this information with conventional MRI findings can be straightforward. However, often this is a very complex process and having the analysis performed by neuroradiologists that are dedicated and experienced with the techniques can make a significant difference in the utility of the analysis. Spectroscopy – single voxel, multi-voxel 2D and 3D: These studies give a metabolic signature of the mass. Perfusion – CT and MRI : These studies allow for analysis of the blood flow and blood volume of brain lesions. Perfusion analyzes the angiogenesis present in masses. CT perfusion is being extensively utilized to evaluate the ability to successfully treat acute stroke patients. Diffusion examinations – diffusion weighted, diffusion tensor imaging: These studies allow for analysis of apparent diffusion coefficients, mean diffusivity, fractional anisotropy, eigenvectors, and tractography. Magnetic resonance venography (MRV) – gadolinium enhanced, time of flight and phase contrast technique: Utilized to evaluate for venous sinus thrombosis, tumor compression and presence of venous stenosis. Magnetic resonance angiography (MRA) – gadolinium enhanced, time resolved, 2D and 3D phase contrast, 2D and 3D time of flight (TOF): These methodologies are utilized to study stroke, aneurysm detection, coiled aneurysm follow-up, arteriovenous malformation analysis, and arteriovenous fistula detection. Spine CT and MRI– Comprehensive spinal imaging services are provided. Degenerative, demyelination, inflammation, and oncological imaging is performed. Techniques are optimized for the cervical, thoracic, lumbar and sacral spine. Brain MRI and CT – Comprehensive brain imaging is performed. Protocols are optimized for acute stroke, subacute and chronic stroke, seizure, pediatric, tumor, demyelinating disease (multiple sclerosis), inflammation/infection, functional mapping, and dementia imaging.